You may already have played Triple Action Frenzy and Triple Extreme Spin but if you thought that the series had come to an end then how wrong you were; this game from IGT is called Wheel Of Fortune: Ultra 5 Reels, it’s developed by IGT and it’s still loosely based on the famous Wheel Of Fortune television show. 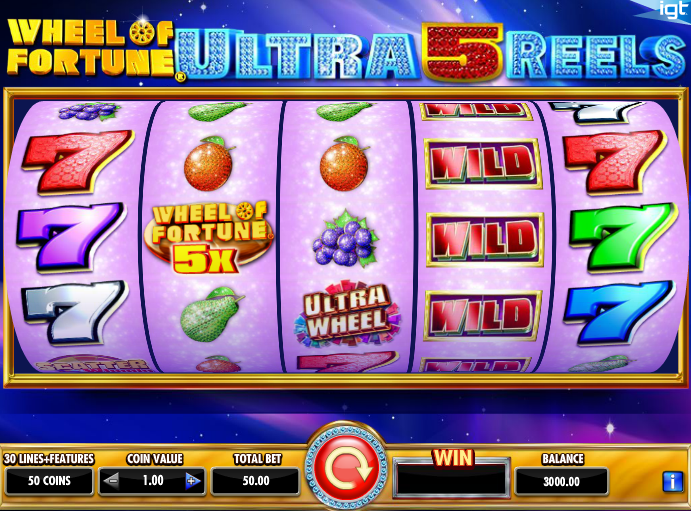 Wheel Of Fortune: Ultra 5 Reels is a five reel slot with three rows and thirty fixed paylines; the design is simple but glossy (not unlike the TV show) with the symbols spinning on sparkly purple reels under plenty of neon lights. There are an equally glossy set of symbols including different coloured sevens – red, blue, silver, purple and green, grapes, pears, oranges and lemons. Sevens can form winning combos even if they are of a different colour. The wild symbol is a big ‘Wild’ and it will multiply any wins to which it contributes by up to 5x; it replaces all others except the Scatter Wheels and Ultra Wheels icons. 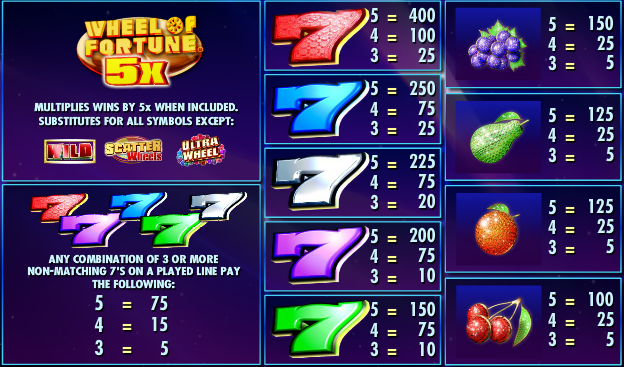 This is triggered by landing three or more of the Scatter Wheels symbols anywhere in view; each of those will now transform into a Wheel Of Fortune which will award a cash prize proportional to your stake. Trigger this by landing three of the Ultra Wheels symbols anywhere on reels two, three and four; as you can see from the video above you will first get to spin the blue, red and purple reels which will determine the wheels spun in the next part. That wheel awards a cash prize on each one. Ultra 5 Reels is another glossy addition to this series and well worth checking out if you are fans of the two predecessors. In our experience both features were easy to trigger and the game comes with an RTP which varies between 91.96% to 95.96%.